the red carpet will soon be rolling out. This autumn, the three magnificent buildings located opposite the splendid Hofvijver will open to the public together for the first time. Lange Vijverberg 14, 15 and 16 present the collections of Dr Abraham Bredius, Hoogsteder & Hoogsteder and Cornelis Kruseman. 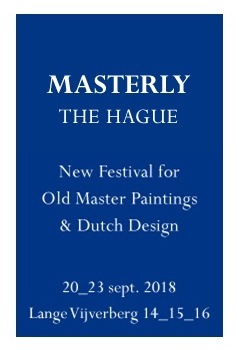 Masterly The Hague introduces these historical paintings in combination with work by contemporary designers specially commissioned for this event. Rembrandt’s Christ could be showing alongside your design. Haute couture by Viktor & Rolf appears in combination with the superb armour and the elaborate collar in the portrait of Frederick Henry, Prince of Orange, by Michiel van Mierevelt. The metres-high metal sculptures of flowers by Linda Nieuwstad are paired with the roses held by the wealthiest woman of seventeenth-century Amsterdam, immortalised by Jurriaen Ovens. Photography duo Petra and Erik Hesmerg exhibit alongside a mysterious Sottobosco painting, an example of the extremely rare work of J.M. Sartori. And chosen to accompany nineteenth-century court artist Jean-Baptiste Van der Hulst, is textile designer Jan Koen Lomans. Together with these, another 25 masters of Dutch Design also have a chance to participate in Masterly The Hague. Curator Nicole Uniquole chooses which master designer appears with which Old Masters. For four days, these amazing combinations of contemporary and old masters are presented here for you to admire. They offer you a new perspective on Old Masters and Dutch Design – and they are available to purchase. For more information about Masterly The Hague or to buy tickets, click here. for Old Master Paintings and Dutch Design.